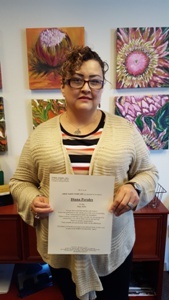 Diana Perales was chosen for employee of the month, for her dedication to her clients. Diana goes above, and beyond for her clients and their families. She also works with our special needs clients, and they all fall in love with her. Diana is a team player, collaborating with hospice, and home healthcare to make sure all the protocols are followed daily. She’s always willing to help the office when she can. Diana has 7 years of care giving experience. Diana is highly skilled in hospice, paralysis and dementia/alzheimer cases. She’s a very easy-going, and enjoys working with all kinds of clients. Diana is an excellent cook her favorite foods to cook are: mexican, italian, american & Mediterranean. In her spare time she enjoys reading, shopping and traveling. Diana has completed her First Aid, and CPR training, and Hired Hands Defensive Training course. She’s been a valuable member of the Hired Hands team since May 2015. Diana takes pride in her ability to follow directions/instructions, and keeping a close watch, and reporting any difficult situation. Diana loves the feeling she gets when she sees her client improving, and providing them a better quality of life. Diana is a perfect example of what a Hired Hands care giver looks like!